Hologate is an award winning virtual reality attraction that transports you to a new world where you could be battling robots and dragons, having a snowball fight with your friends, or fighting off a hoard of oncoming zombies! 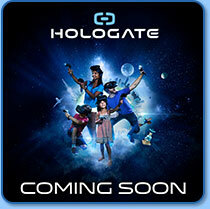 Hologate is a physically engaging, immersive experience that’s suitable for players of any age and skill level. Keep playing to discover new worlds, obtain the high score, and earn bragging rights among your friends. Come in and try Hologate at FunworX today! Open June 2 at FunworX! 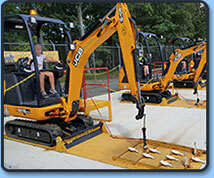 Explore real construction equipment that has been uniquely modified for adults and children of all ages to have fun! Three exciting challenges include Shapes Challenge, Maze Challenge and Bowling Challenge! Some height restrictions apply. Blast everyone with thousands of foam balls! Great fun for kids, parents and even grandparents! Ropes Course has participants traverse horizontally across activities/elements two stories in the air while safely secured to the overhead tracking system. 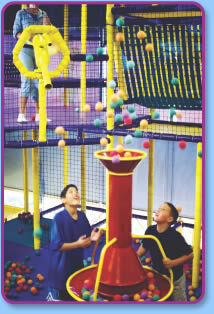 Three-level Play Structure offers hours of fun for kids ages 2-12 years of age. The giant play structure includes slides, tunnels, tubes and ladders. Note: Socks must be worn in the play structure. Visit GameworX Arcade and play in the region's largest arcade! Play a huge variety of games and choose from thousands of redemption prize options! Visit our arcade with the family, or come with some friends. GameworX is even fully licenced!